Researchers have long known that an interviewer’s race or ethnicity can affect the way respondents reply to a question, both face-to-face and on the telephone. Yet few researchers have studied how respondents actually perceive their interviewer’s race or ethnicity over the phone. A new analysis of a Pew Research Center telephone survey finds that many respondents incorrectly identify their telephone interviewer’s race or ethnicity. The survey, conducted Feb. 29-May 8, 2016, among 3,769 adults, focused primarily on the topic of race relations, racial equality and discrimination. 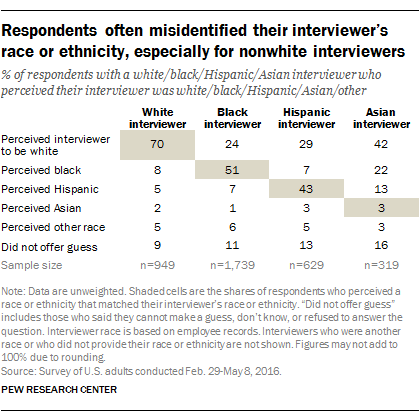 The analysis of the responses shows that there is often a mismatch between what respondents perceive to be the interviewer’s race or ethnicity and the race or ethnicity specified in the interviewer’s employee records. About half of respondents overall (49%) guessed a race or ethnicity that didn’t match the interviewer’s self-identified race or ethnicity, while 40% guessed “correctly” and 11% said they could not make a guess or refused to answer. Respondents were most accurate in identifying the race of white interviewers. Seven-in-ten correctly answered that they were talking to a white interviewer. In contrast, about half of respondents with black interviewers (51%) and 43% with Hispanic interviewers guessed that their interviewer was black or Hispanic, respectively. Almost no one (3%) contacted by an Asian interviewer correctly identified their interviewer’s race. A 60% majority of respondents who did not correctly identify the race or ethnicity of a nonwhite interviewer guessed that the interviewer was white. Respondents who were the same race or ethnicity as their interviewer often were more likely than respondents not of that race or ethnicity to guess correctly, but still sometimes got it wrong. For example, 59% of Hispanic respondents with a Hispanic interviewer guessed correctly, while one-third guessed incorrectly and 8% said they could not make a guess, didn’t know or refused to answer. By comparison, just 23% of non-Hispanics with Hispanic interviewers guessed correctly, 58% guessed incorrectly and 18% didn’t offer a guess. The vast majority of interviews of Hispanic respondents conducted by Hispanic interviewers were conducted in Spanish. Among Hispanics being interviewed in Spanish by Hispanic interviewers, 62% guessed their interviewer was Hispanic. Among blacks with black interviewers, 63% guessed their interviewer’s race correctly, while 32% guessed incorrectly and 5% did not offer a guess. In contrast, 45% of nonblacks with black interviewers guessed correctly, 41% guessed incorrectly and 14% didn’t offer a guess. Whites, on the other hand, were no better than nonwhites at guessing the racial identity of their white interviewers. About two-thirds (68%) of whites with white interviewers guessed correctly, 20% guessed incorrectly and 12% did not offer a guess. 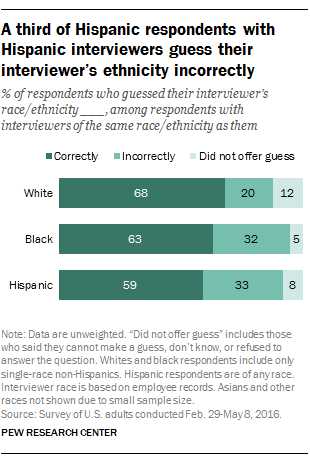 Among nonwhites with white interviewers, 73% guessed correctly, 22% guessed incorrectly and 6% did not offer a guess. Establishing the interviewer’s perceived race or ethnicity is essential to understanding how it might affect the respondent’s answers to survey questions, given the relatively high likelihood of a respondent misidentifying an interviewer’s race or ethnicity in a telephone survey. Previous studies have found that both black and white respondents tend to report more favorable attitudes toward blacks when speaking to a black interviewer, and less positive attitudes toward blacks when speaking to a white interviewer. This is thought to be a form of the so-called social desirability effect, in which most respondents want to avoid offending the “polite stranger” who has called them on the phone or visited them at their home by expressing mistrust or hostility toward people who share the interviewer’s race or ethnicity. Most studies in this area have focused on the effect the interviewer’s race has on race-related questions, but there is also some evidence that this effect could extend to other topics such as voting and political knowledge. The social desirability dynamic makes it all the more important to understand how accurately respondents perceive their interviewers. Analysis of the Center’s 2016 telephone survey shows that perceived interviewer race and ethnicity had an impact on some sensitive race-related questions but not others. For example, white respondents were more likely to say that the topic of race relations comes up at least sometimes in conversations with family and friends if they perceived their interviewer to be black (66%) than if they perceived their interviewer to be white (53%). Yet they were not significantly more likely to say the same about the topic of racial inequality if they perceived their interviewer to be black rather than white (61% vs. 56%). On some questions, the perceived race of interviewer mattered for some respondents but not others. For example, black respondents’ stated support for the Black Lives Matter movement varied according to whether they thought their interviewer was black or white, but white respondents’ support did not. Among black respondents who had heard at least a little about the movement, 58% of those who thought their interviewer was black said they strongly supported it, compared with 44% of those who thought their interviewer was white. Among whites, the difference was not statistically significant: 21% of those who believed the interviewer was black expressed strong support, versus 15% of those who believed the interviewer was white. Conversely, responses about personal experiences with racial discrimination varied based on perceived race of interviewer among white respondents, but not among blacks. White respondents were more likely to say they had ever been racially discriminated against if they believed their interviewer was black (36%) than if they believed their interviewer was white (24%). Black respondents were not significantly more or less likely to report that they had experienced racial discrimination based on whether they thought their interviewer was black or white. Overall, black respondents were considerably more likely than whites to say they have experienced discrimination due to their race.